1. In a reflex manner; as, "He answered automatically." 2. In a mechanical manner; by a mechanism operating with minimal human intervention; independent of external control. 1. Behavior that is not under the control of the will, as a reflexive response. 2. An apparently goal-directed activity that is not, in fact, under the conscious, voluntary control, of the subject (occurring in epilepsy, catatonia, and fugue states). This subject includes the performance of acts without conscious will, as, for example, after an attack of epilepsy or a concussion of the brain. In such conditions, the person may perform acts of which he or she is neither conscious of at the time nor has any memory afterwards. It is especially liable to occur when people suffering from epilepsy, mental subnormality, or concussion consume alcoholic drinks. Any apparatus or instrument for recording automatic or involuntary movements. 1. A self-operating machine or mechanism, especially a robot: The Smiths bought an automaton, a special device which would mow the lawn in their garden all by itself. 2. A mechanical figure or contrivance constructed to act as if by its own motive power: Tommy got an automaton for his birthday, which looked like a little soldier and could be operated by winding it up so it would walk around in his living room. 3. Someone who acts or responds in a mechanical or apathetic way: Only an automaton wouldn't have noticed the threat of the thunderstorm. 4. A person or animal that acts in a monotonous, routine manner, without active intelligence: The whole football team sat around after the game, like automatons, lifeless and depressed after losing the last game of the season. 5. 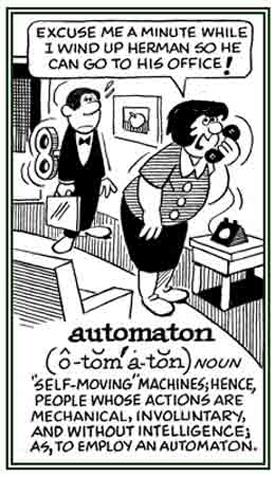 A mechanism that can move automatically or without an external motive force; such as, an android: The cell phone that Janet has can be considered to be an automaton in that it responds to encoded instructions. © ALL rights are reserved. An abnormal fear of ventriloquists' dummies, wax statues, or anything that represents a non-living being that appears to have feelings or perceptions: Tom couldn't stand animatronic creatures after being at the circus with his family, and he developed automatonophobia after having nightmares about such humanlike figures chasing and attacking him! A small device placed in a photocopier to enable copying to begin and to record the number of copies made. 1. In an organism, the mimicking of one anatomical structure by another to accentuate the former; for example, the ears of some antelopes that mimic their horns in acting as visual signaling devices. 2. Mimicry in which a palatable morph (the mimic) resembles a non-palatable morph (the model) of the same species; the polymorphism with respect to palatability can arise from a choice of different food plants by model and mimic. Spontaneous revival of memories of an earlier condition of one's life. 2. The judgment of others by analogy from the knowledge of one's self. 3. An ascription (relating a particular cause) to others of one's own characteristics. 1. Moving by itself; self-propelling or self-propelled. 2. Of or relating to self-propelled vehicles. 3. Relating to motor vehicles; such as, "automotive supplies". 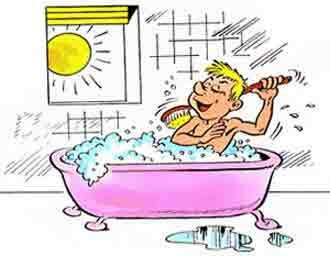 An excessive fear of being dirty and stinking, or of personal filth which may result in abnormally frequent bathing, as shown in the illustration below: Ted thought that he needed to take a long bath or shower each morning, every time he came home from school, and in the evening, thinking that he smelled quite offensive to himself and to others, and developed automysophobia. Showing page 14 out of 24 pages of 354 main-word entries or main-word-entry groups.